Wolff’s products come neatly packaged, and include information on the inside of the tag(s). Be sure that you read and understand it prior to using their products. 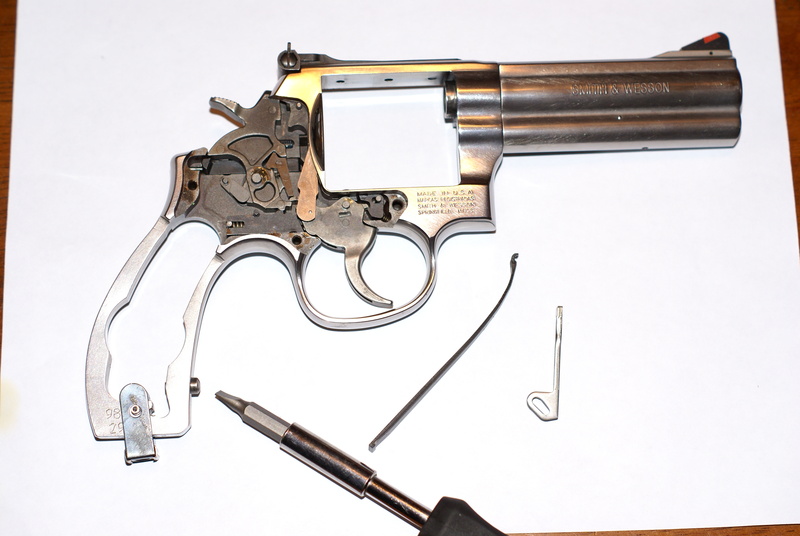 In this review the type 2 Revolver Shooter’s Pak (reduced power, SKU#17121) was used. Contained in the outer bag are 13, 14, and 15 pound rebound springs, and a reduced power mainspring that are individually bagged. 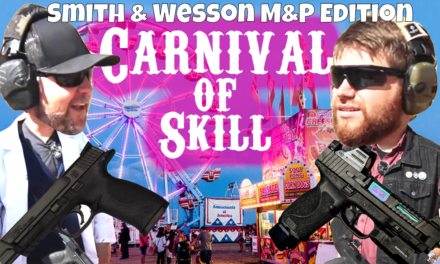 Always be sure that the firearm is unloaded! To see the difference in pull weight, I needed to find out what the original pull was. 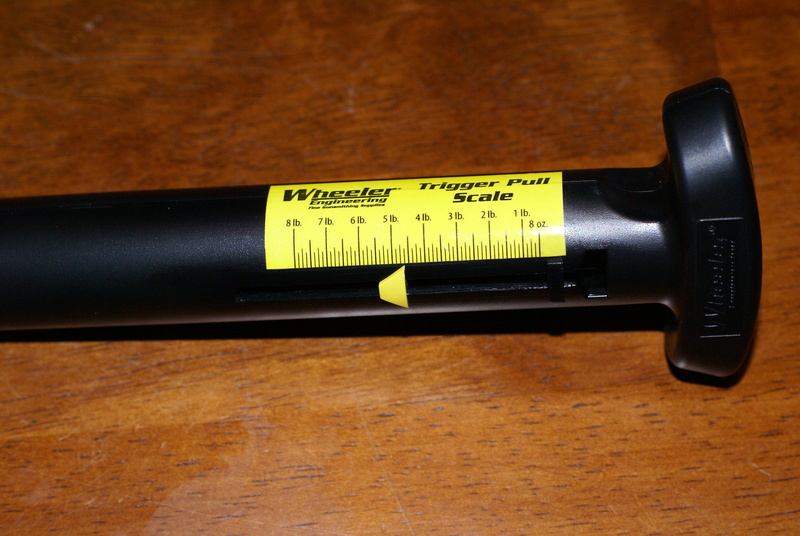 After measuring with a trigger pull scale, I had found that the single action pull was 4 lb., 10 oz. The double action pull was off of my scale, and I had to use a different one. It came in at 11 lb., 10 oz.! 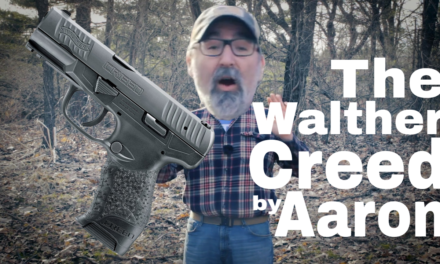 The test firearm is a S&W 686P. The pak comes neatly packaged, with the product’s information on the front. Inside are the 13, 14, and 15 lb. rebound springs, and a reduced power mainspring. I prefer to use snap caps or dummy rounds when dry firing. 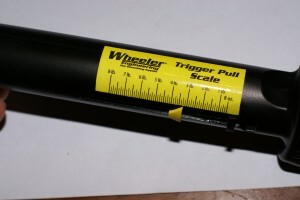 A trigger pull scale is a useful tool for comparing before and after results. 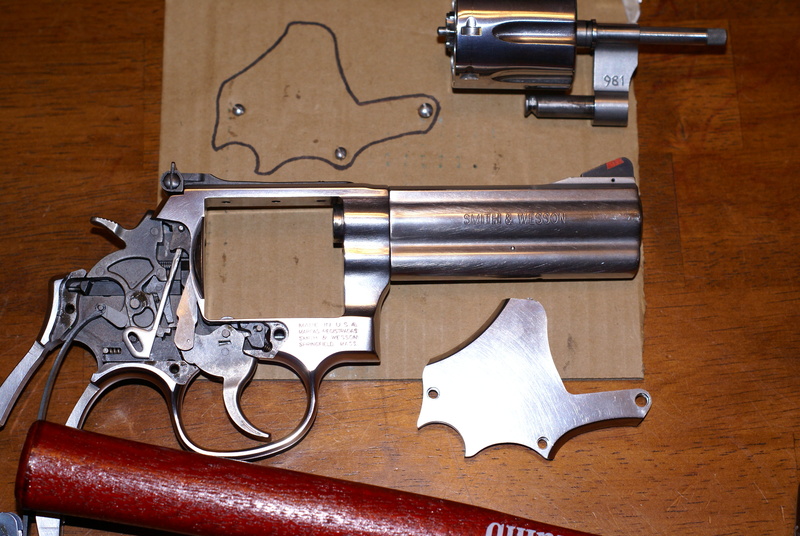 The factory single action pull is shown here. After removing the grip, frame screws, the yoke and the cylinder, I used the handle of a hammer to strike the back-strap to remove the side plate. Don’t pry it off, as it will damage the frame and plate. Next, the strain screw is loosened, and the mainspring is removed. Using a rebound slide tool, the spring and slide are removed by pushing in and up. At this time, I cleaned and lubricated the inside of the frame, and its components. Comparing the Wolff springs to the stock S&W ones, I noticed some differences. The mainspring hooks have a slightly different shape, and the body of the Wolff mainspring had a rib formed in it. 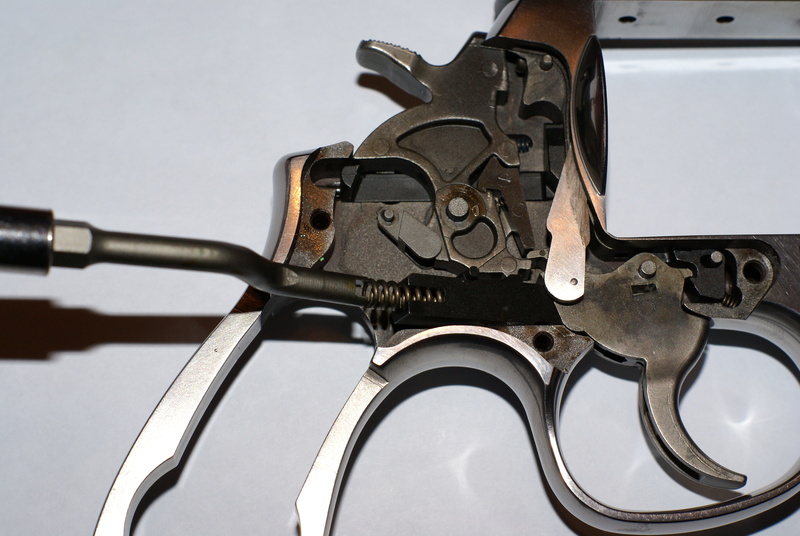 Also, the bottom of the S&W spring had a small tab to lock into a notch in the bottom-strap, versus the angled bottom of Wolff’s. During the fitting I did need to stone a small area on the back of the hooks. 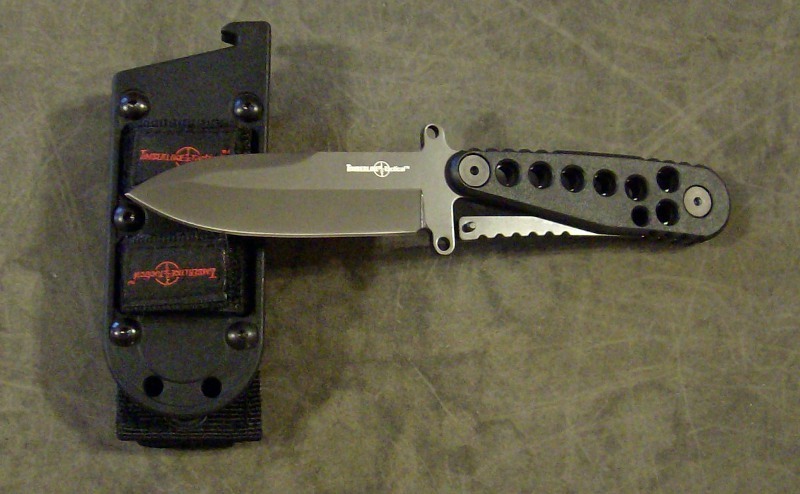 After a couple of passes the new mainspring hooks had closer tolerances versus the S&W’s stock spring, and fit securely. Your installation experience may differ. The rebound springs were a little different too. The S&W spring was shorter than Wolff’s, had thicker coils, and was roughly ground down on both ends. The Wolff rebound spring had cleanly cut coils, and were bur-free. 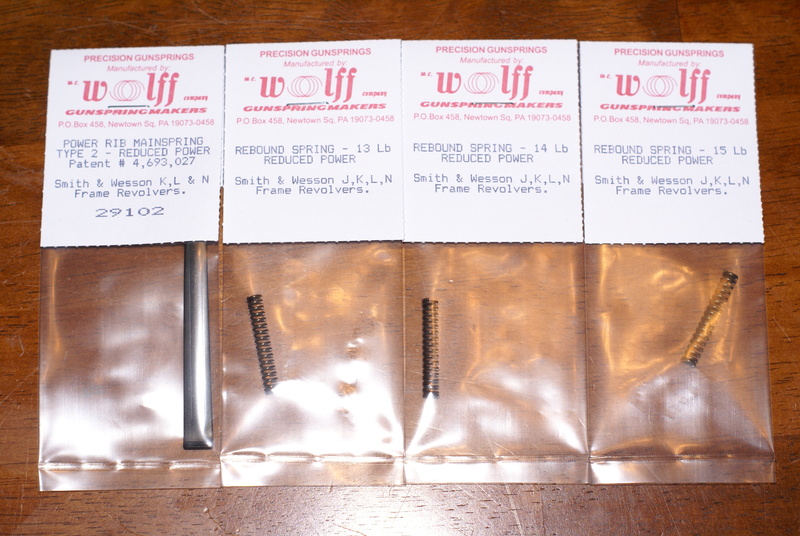 The installation of the Wolff spring kit is the reverse order of dis-assembly. I used the 13 lb. 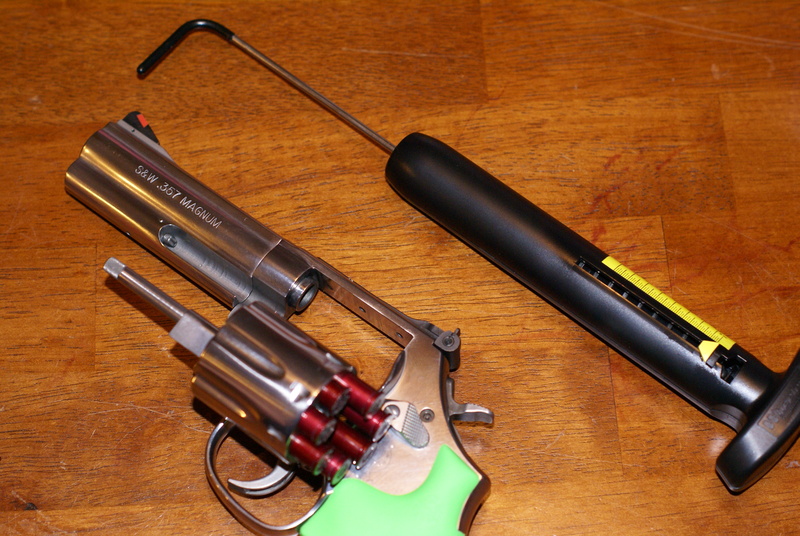 rebound spring with the reduced power mainspring in order to get the lightest trigger pull possible. While removing the screws for the side plate, I inserted them into a piece of card board that had an outline of the plate. 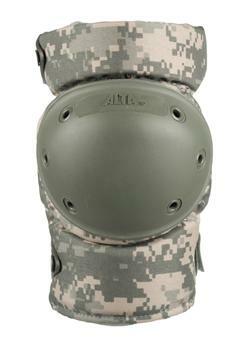 This is useful with different sized fasteners. The strain screw is left in the frame to prevent loss. Since the hammer block was free, it was removed as well. 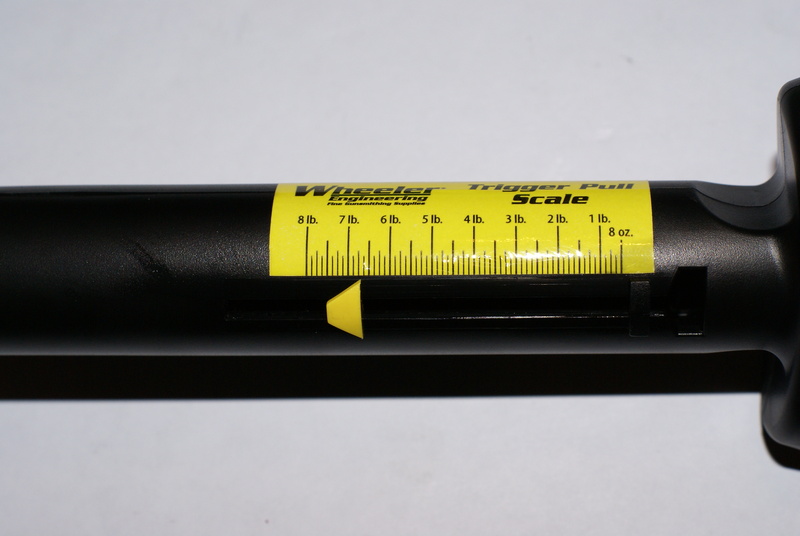 Using a rebound slide tool, the removal of the spring and slide was easy, and prevented the spring from flying across the room. 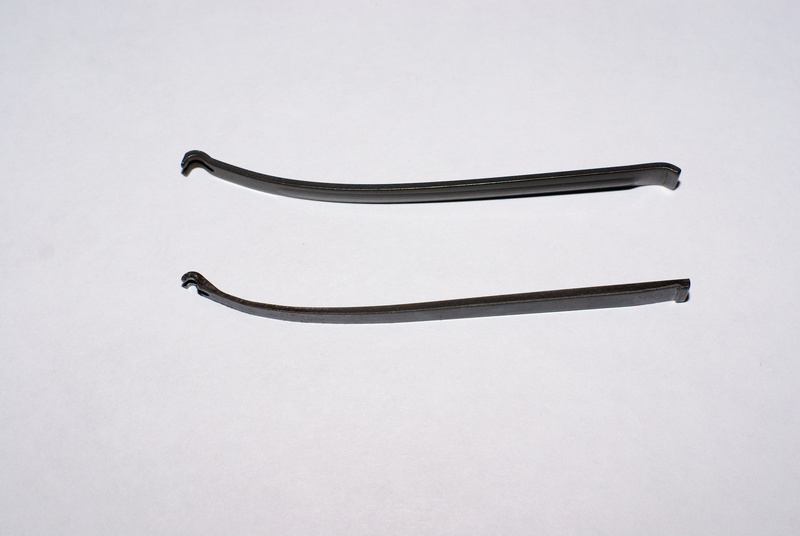 You can see the differences between the Wolff (left) and stock (right) springs. The hooks and bases are different as well. 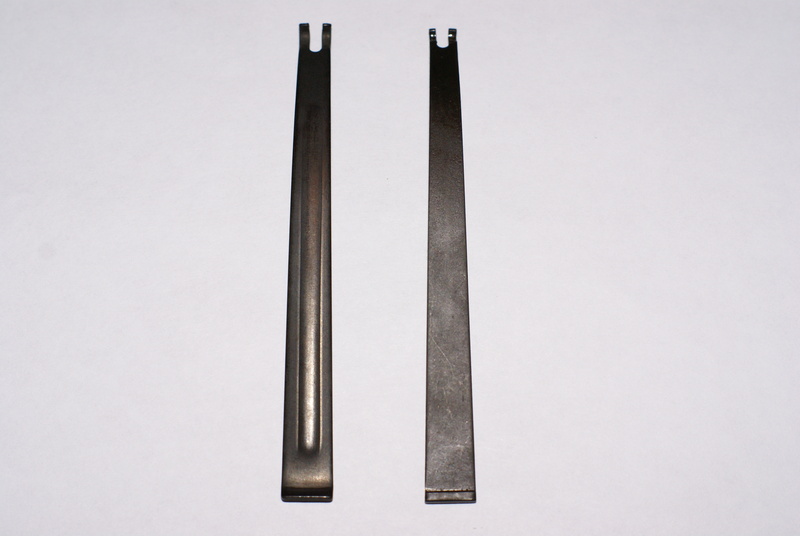 The Wolff (left) rebound spring is slightly longer and has thinner coils than the stock (right) one. 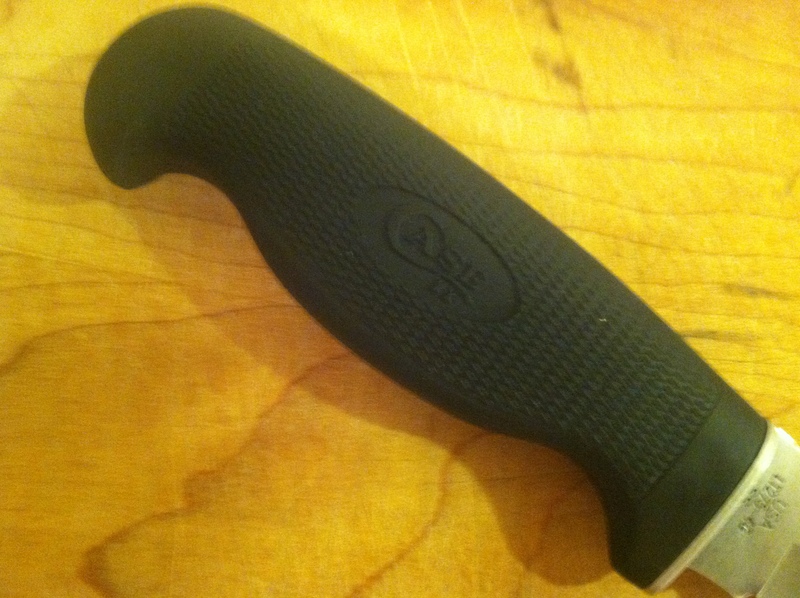 The ends of Wolff’s spring also have a smoother finish. After re-assembly, I pulled the trigger a few times checking for proper function. While I was doing this I could feel the change. The action felt smoother, more consistent, and significantly lighter, while the hammer offered only slight resistance when pulled back. The results from the trigger pull scale say it all. A major improvement! 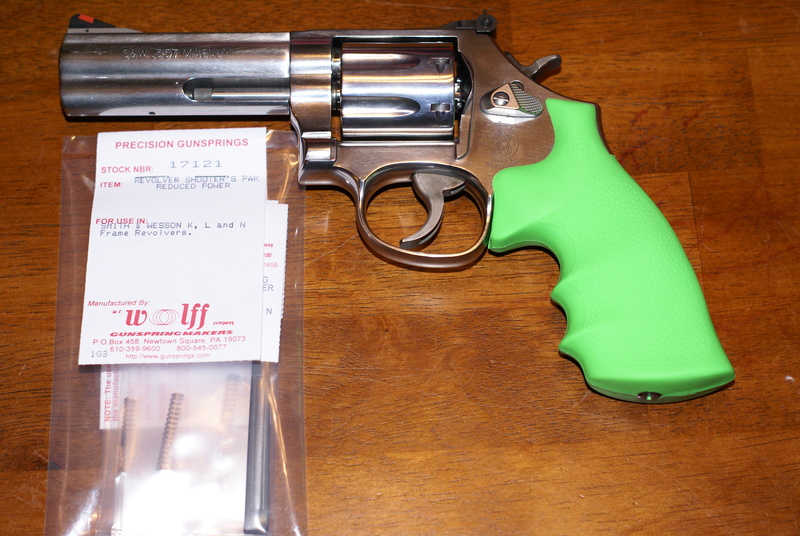 The single action pull was reduced to 3 lb., 4 oz., and the double action registered on the scale at 6 lb., 10 oz. The difference is 1 lb., 6 oz. (single action), and a solid 5 lb. (double action). The double action test result. 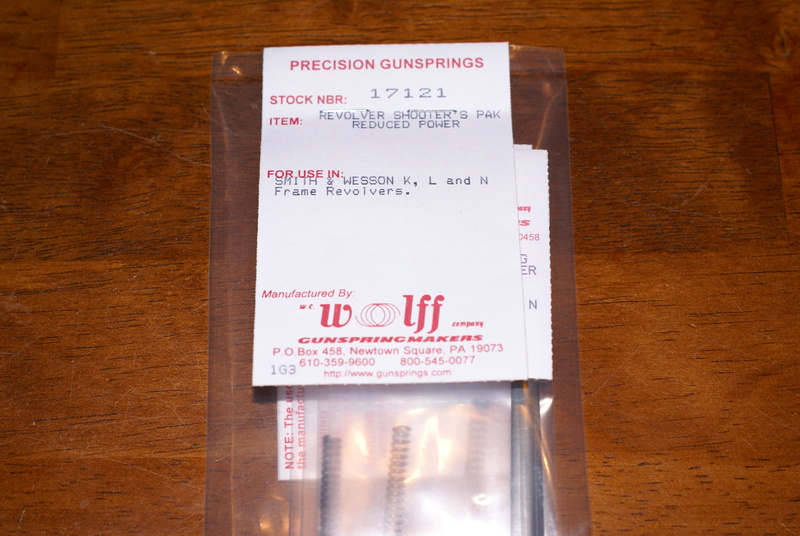 I’m very happy and impressed with the Wolff Gunsprings products. The fit and finish are excellent, as are the end results. For the price of this kit ($15), you can’t go wrong. 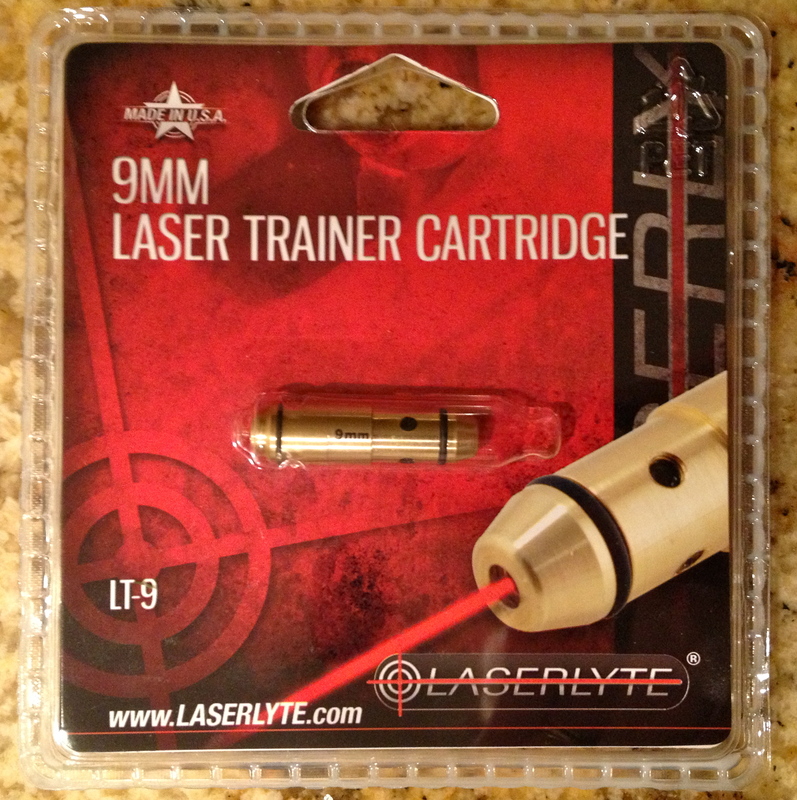 Now that I’ve tested these products, I’m planning on replacing the springs in some of the other firearms I currently own, and others in the future. 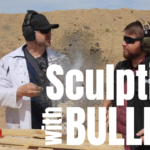 The bottom line is that I would highly recommend Wolff Gunsprings to anyone who may be looking to improve the function or operation of their firearm.